Home » Academics » Schools » School of Science, Engineering and Technology » Faculty » Bahman Rezaie, Ph.D.
Bahman Rezaie, Ph.D., earned his doctorate in Electrical Engineering from Southern Methodist University in 1984. The results of his thesis on image registration and pattern recognition were published as a paper in IEEE Transactions on Aerospace and Electronic Systems in November 1984. 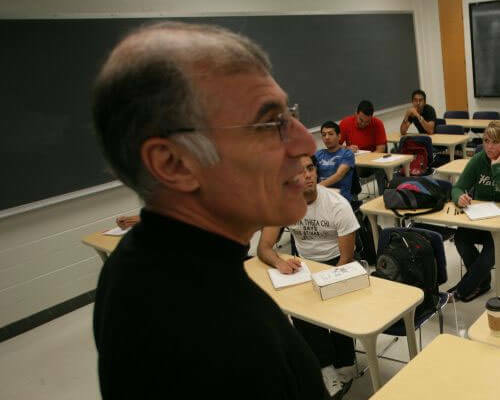 After teaching for three years at Southern Methodist University, Rezaie joined St. Mary’s University where he is currently the Piper Professor of the Engineering Department. In 1980, Rezaie was awarded a $300,000 research grant by the National Science Foundation. The research was titled “Rotation Invariant Image Registration” and was geared to investigate rotation invariance of certain features on different images to develop a class of fast algorithms to detect and register rotated objects within the image scene. At St. Mary’s University, he has served as the Acting Dean of the School of Science, Engineering and Technology since 2000. In addition, he was the Chair of the Engineering Department from 1993 to 2016 before returning to teaching full time. Rezaie is a member of Eta Kappa Nu and Tau Beta Pi honorary societies of engineering.